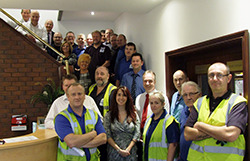 Almost a quarter of employees at Gilberts Blackpool have been with the manufacturer for at least 20 years. The level of staff commitment is proving especially important: Gilberts is seeing significant growth in business, to the extent it has had to extend its 80,000sq ft head office, engineering and R&D facility. It is adding almost 10% more space for manufacturing and warehousing to accommodate a growing, international order book. The company is unique in undertaking all aspects of its production in house, from design to formation of dyes to manufacture, enabling it to give clients the reassurance of quality control whether off the shelf or a bespoke design. It is also unique in the air movement industry in having, in house, its own advanced test centre, which was entirely designed and built using internal expertise.